We’re a little more than a month away from the opening of the 2017-18 season, and already players are caught up in the rumor mill, sitting ready on the trade block. Matt Larkin of The Hockey News has revealed the names of 10 trade candidates for the upcoming campaign, and though some have been mentioned throughout the summer, others are just getting started to get dizzy in the mill! Larkin wants to see the Carolina Hurricanes jump on the market and trade some of their blue line depth. I mean they have plenty and could benefit from adding a top-line pivot to their roster. Jaccob Slavin led the Canes in minutes while he played on the top pair last season, showing he is ready for more responsabilities. They have Brett Pescen and Noah Hanifin in town, and great prospects like Haydn Fleury and Jake Bean are making their way to the big leagues. 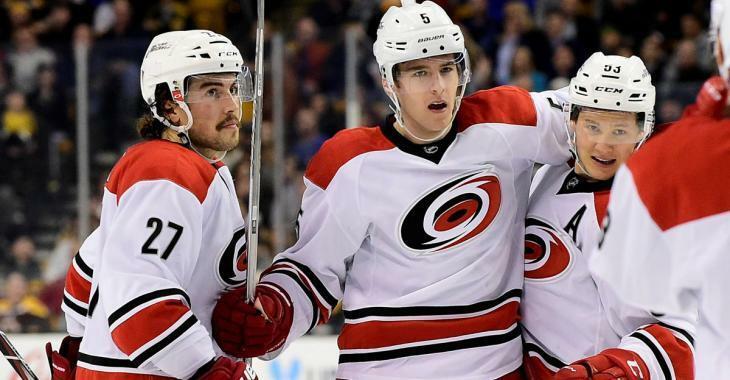 Justin Faulk used to be the first defender of the team, but youngsters are taking over and the Hurricanes could decide to move him to get help and the first-line pivot they truly need.